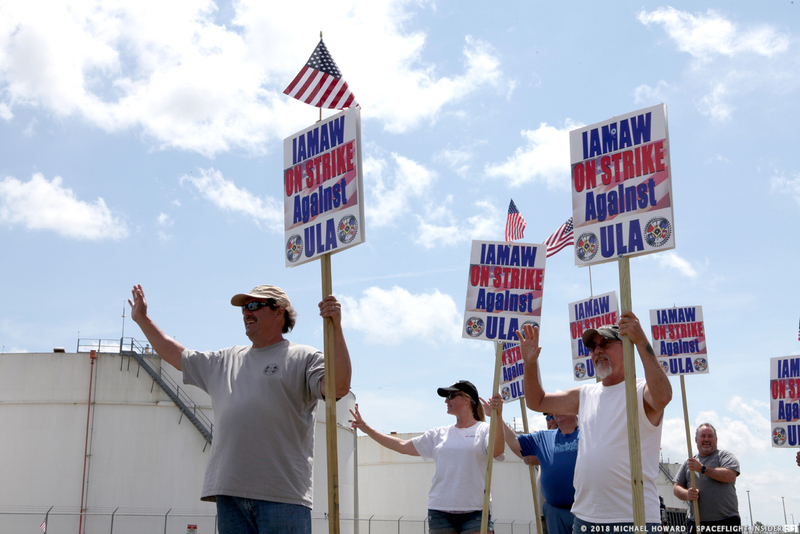 KENNEDY SPACE CENTER, Fla. — Members of the International Association of Machinists and Aerospace Workers (IAMAW) have begun picketing United Launch Alliance (ULA) practices in Cape Canaveral, Florida; Decatur, Alabama; and Vandenberg Air Force Base, California. Their protest stems from their rejection of what has been described as ULA’s “last, best, and final offer” of a contract. According to the union, ULA’s new contract requires workers to relocate long distances for up to six months with very little notice, and to work mandatory overtime – also with no notice. The IAM is concerned that ULA is attempting to replace workers with sub-contractors. Workers say they will continue striking and picketing until the company meets their demands, which include making travel and overtime work voluntary and based on seniority. Workers also want guarantees that their jobs will not be replaced. United Launch Alliance has said that its contract offer is fair, competitive, and better than anything offered by its competitors. Workers say, however, that SpaceX’s entrance into the launch market has triggered; “…a race to the bottom” in terms of employee treatment. ULA has agreed to meet with the IAM and a federal negotiator in Glendale, California. Kevin DiMeco, the Vice President with the International Association of Machinists and Aerospace Workers is optimistic that the situation will be resolved amicably. DiMeco also wanted to emphasize that the dispute is not about money, but about the unfair disruptions to workers lives with unreasonable travel and overtime demands. “It’s kind of unacceptable, you know what I mean? They can’t come up to a guy that has a family here and a home, and expect him just to leave for six months without some type of warning or preparation,” DiMeco told SpaceFlight Insider. The meeting with federal negotiations is tentatively scheduled to take place in Glendale, California at May 15.